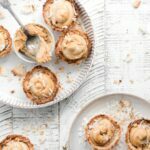 Recipe for Cashew Coconut Cups, light and crunchy coconut cups filled with cashew nut butter cream. Tasty and filling treat, packed with protein and sweetened with maple syrup. I always keep several different types of nut butter in my pantry. Some flavors for baking, some for toast, and others I just eat straight out of the jar with a spoon. Come on, you know you’ve done it too! 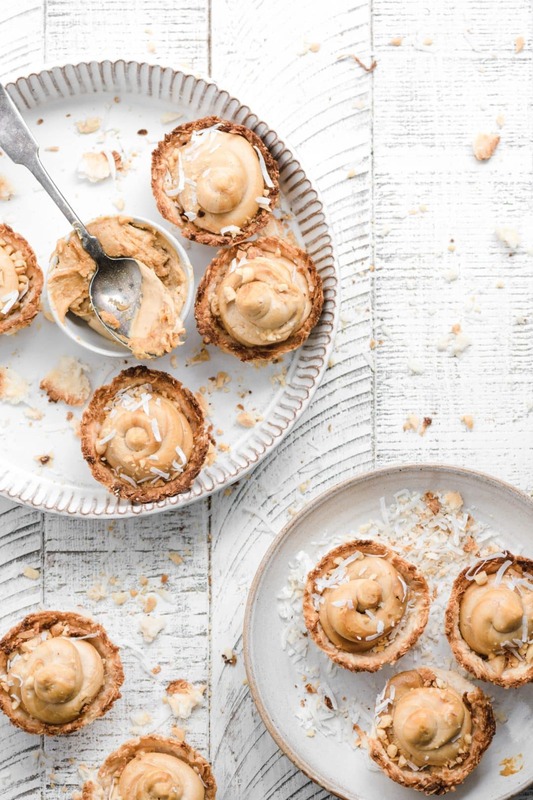 Cashew Nut Butter has the same consistency as peanut butter but made from cashews with a little added sea salt. Full of heart healthy fats and high in protein makes it a great addition to a low carbohydrate diet. 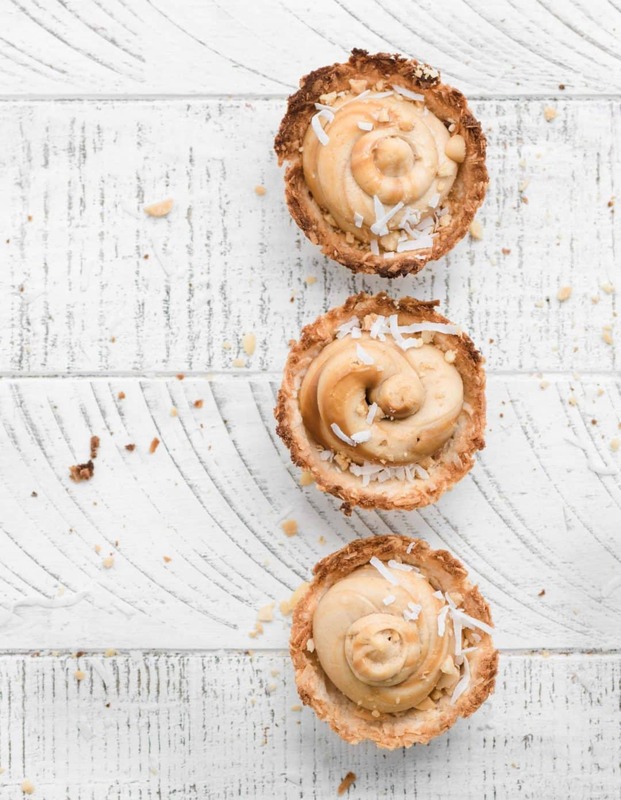 Are Cashew Coconut Cups Low Carb? 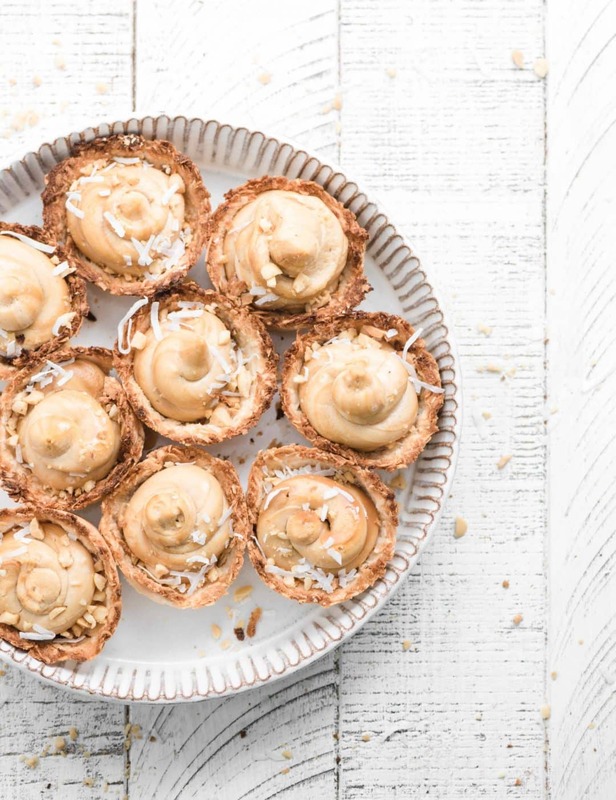 These cashew coconut cups are made with coconut flour, a grain free flour that is high in fiber and protein. 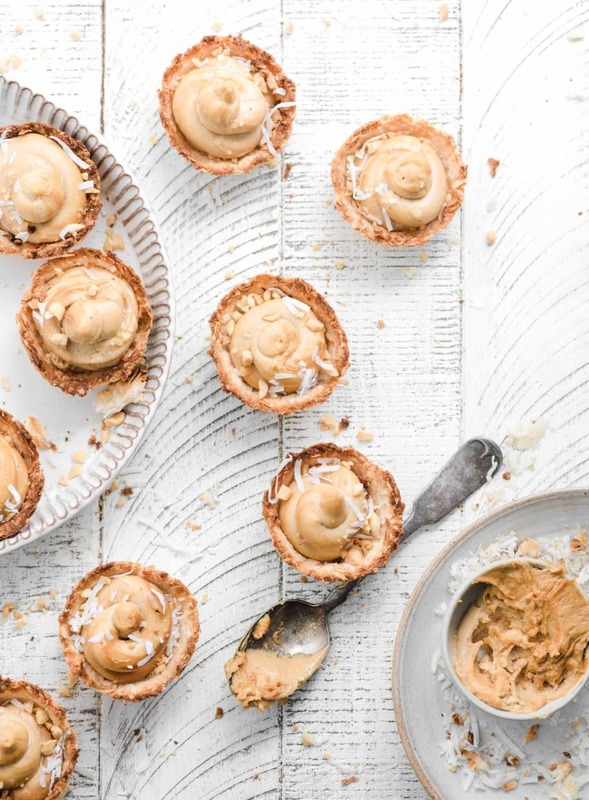 Pair the coconut cups with creamy low carb cashew butter and you have a filling, tasty, and low carb treat. 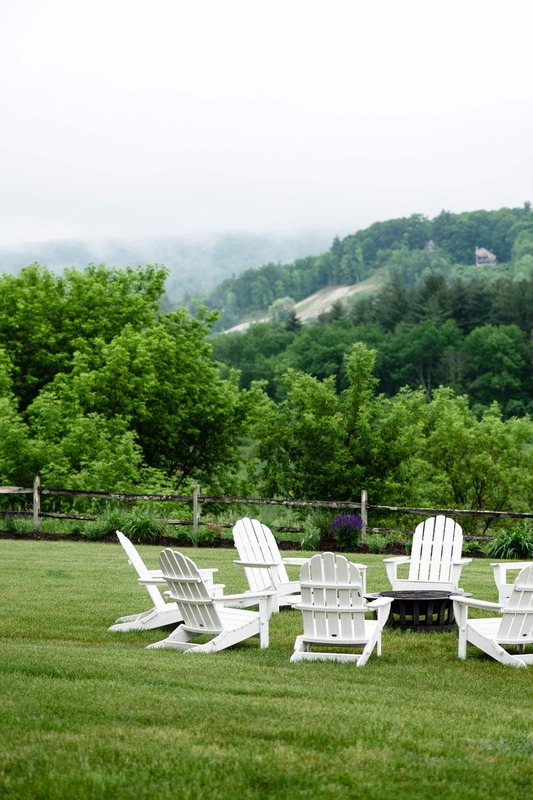 However, maple syrup is not on the list for low carb sweeteners and must be substituted with Erythritol or Stevia. Preheat oven to 350° F. Grease 12 count mini muffin pan with coconut oil or coconut spray. In a large bowl combine coconut flakes, coconut flour and salt. Next, stir in coconut milk, coconut oil, and maple syrup. I use a spatula to fold and incorporate mixture. Spoon mixture into individual muffin slots. Divide entire mixture evenly amongst the 12 cups. Press coconut mixture firmly into bottom and up sides of each cup with your fingers. Bake until the edges turn golden brown about 15-16 min. Place pan on cooling rack for 5-8 minutes. Gently use first two fingers and thumb to carefully slide each cup out of pan. Let cups cool completely before adding filling. 10. In bowl of stand mixer with whisk attachment, whip together Cashew Butter and cream cheese. 11. Pour in vanilla and maple syrup. Mix on medium low until blended. 12. In a separate bowl stir together 5 Tbsp Cashew Butter and 3 Tbsp Dulce de Leche. 13. Grab piping bag and with a spoon make a long line from tip to top with cashew caramel mix. Pressing the mix onto the inside of plastic bag. (this will add a dark stripe to your filling). Next scoop you Cashew Butter Filling into your piping bag. Snip off the tip of the bag and start filling your cups. Start in the center and pipe in a circular motion working upwards until full. Press down very gently then lift you piping bag while softly squeezing to create a tip in your filling. Keep refrigerated in an air tight container for two weeks! Store in an air-tight container in the fridge for two weeks! This post is sponsored by Georgia Grinder’s, natural nut butters using non-GMO ingredients. 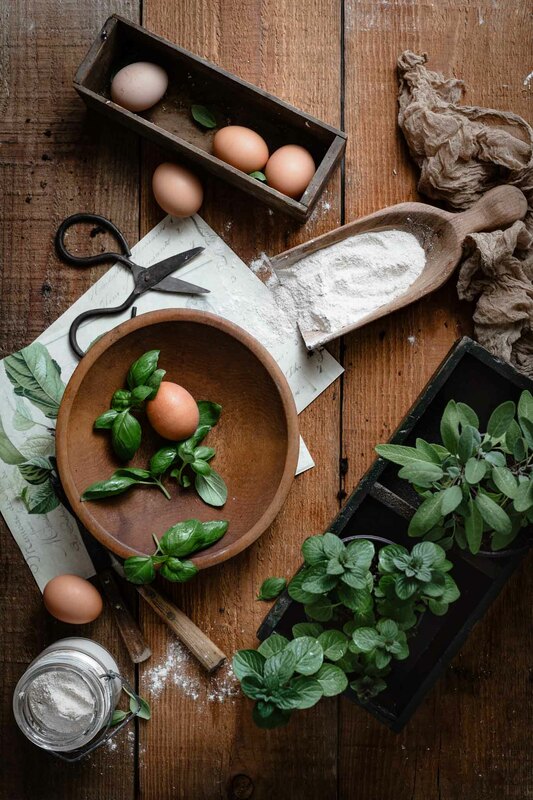 Thank you for supporting brands who help make Two Cups Flour possible! 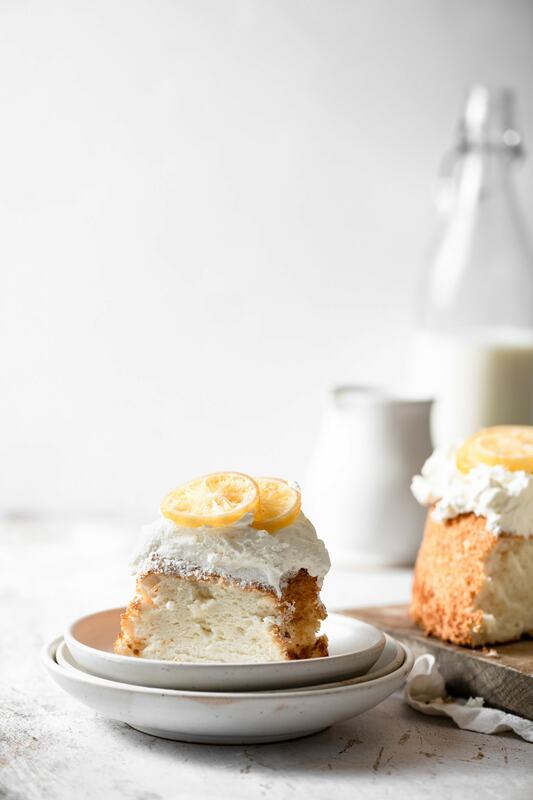 These looks amazing and the recipe sounds so good and easy! Can’t wait to try this one!